This year I am growing TOMATOES!!!! Limbaugh Potato Top, Glamour, Cherokee Purple, Del Rey wild tomatoes, red beefsteak, baby lettuces (which did smashing this year with 5 separate harvests), broccoli (but it probably won’t head), and all of my herbs [and other items]: plantation mint, peppermint, sage, garlic chives, onion chives, Greek oregano, spicy oregano, pronated rosemary, English thyme, French thyme, Provence lavender, bay tree, hops (magnum and nugget varietals), and quinoa. My favorites are my tomatoes this year. They are huge and amazing. My family has always had huge gardens, my grandparents had a beautiful 1-acre garden that they canned and lived on nearly all year long. My mom loved to grow beans and tomatoes, but she also gave me my love of growing 1 new vegetable every year you have never tried to grow before. I remember the year we discovered kohlrabi; sitting on the porch with a knife and a saltshaker and eating raw glorious live food. I don’t hate gardening, but I am a lazy weeder. I am more of a cook-the-food than fool-with-the-food [person]. My broccoli got big but didn’t make any crowns, I won’t try it again, but I am thinking I want to grow chilies next year and maybe zucchini. I will plant plenty of baby lettuce, dill, cilantro. 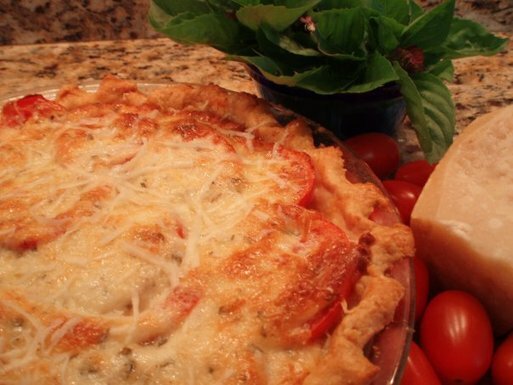 As the tomato season wanes, here’s your last chance to make Chef Michael Kiss’ Tomato Pie at home! It’s simple and sounds so delicious! "photo copyright chef michael kiss"